This entry was posted on Tuesday, October 26th, 2010 at 1:03 am	and is filed under Oakland, Politics. You can follow any responses to this entry through the RSS 2.0 feed. You can skip to the end and leave a response. Pinging is currently not allowed. I’m certainly pulling for Robert. 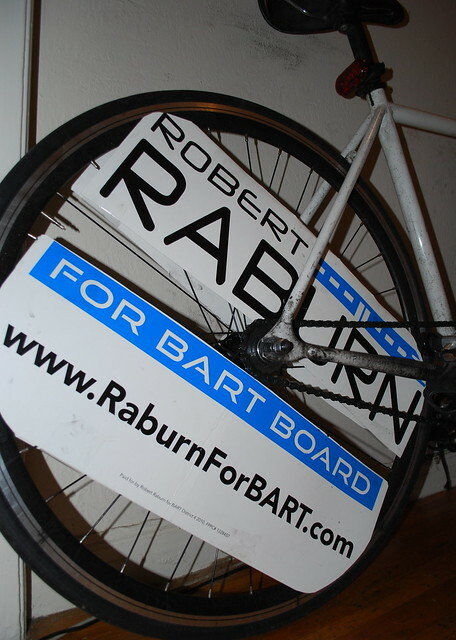 He was the only candidate in any Oakland race to get a campaign contribution from me. So who’s the mayor of Oakland? Did you really xhange your mind about something in the booth? Wordnerd: Nerdy answer: Ron Dellums is the Mayor of Oakland. Real answer: It looks like Don Perata will probably end up being the next Mayor, although he only won 35% of the vote in the first round of counting, so we need to wait until Friday to know for sure that he will pick up enough 2nd- and 3rd-choice votes to put him over the 50% level required to win. (Our “Instant Runoff Voting” system turns out not to be instantaneous after all.) I put him down for my 2nd choice, so I’m perfectly content with his (expected) victory, and I’m open to the possibility that he may be just what Oakland needs at this moment in time. For instance, he’s the candidate of choice in the police department, so he may have more credibility than the other candidates if he tells them that they really have to start paying into their pensions, in exchange for him fighting to protect their jobs. Also, he’s well-connected in Sacramento as the former president of the state senate, and he’s a political ally of Jerry Brown, who just happens to be an Oakland resident and who just happens to have been elected Governor—surely those things can’t hurt Oakland when it comes to getting help (financial or otherwise) from the state. Raburn won! By more than 11 points! It was hard to predict since it was a 3-person race and no public polling had been done, but I guess it’s not a big surprise in a small election like that—fewer than 50,000 people voted in that race, so a candidate like Raburn with a core group of very determined supporters can have a good shot at ousting an incumbent. And yes, I changed my mind while in the booth on a couple small races/ballot measures that I had been going back and forth on. In one case, I voted for a parcel tax to fund police and anti-violence programs, even though I was tempted to vote “no” in order to send a message to the city council that they have to stop mismanaging the city’s finances and them coming hat-in-hand to the voters for yet another bailout (observing the Oakland City Council at work is enough to turn anyone into a tea party sympathizer). In the other case, I voted against an incumbent even though I was almost certain that the incumbent would win—and if I had thought it was a closer race, then I may have ended up voting for the incumbent. It was basically a protest vote. Congratulations (to you and to the whole population) for Raburn’s victory!! California sounds pretty sensible in its election choices to us on the other side of the country. I hope it looks that way there. What does that marginalia comment about errors in a blog post refer to? I didn’t want to be mean-spirited about it in that tweet by naming names, but a certain sloppily-edited local news site published a post titled “election results.” The post said that a parcel tax measure to support Oakland schools had passed, when in fact at this point it is failing to meet the 2/3 threshold required for passage of tax measures in California; and the post said state proposition 24 had passed, when in fact it failed by 17 points; and it said state proposition 26 had failed, when in fact it passed; and it said Democratic candidate Kamala Harris lost the Attorney General’s race, when in fact the vote was too close to call last night, and she is currently leading the count by several thousand votes; and it said that a local Oakland measure would increase the tax on medical cannabis to $100 per $1000 of gross receipts, when in fact it will increase the tax on medical cannabis to $50 per $1000 of gross receipts. Early in the afternoon, I left a comment on the post politely pointing out all these errors, and they still stand uncorrected 8 hours later. Why even bother posting election results if you’re going to get half of them wrong?